The ThINKin' Spot: Peachy Keen Sneak Peek Day and SALE! Good morning and Happy Independence Day!! It's time to celebrate, and we're celebrating this wonderful country of ours with sneak peeks and a BIG sale over at Peachy Keen Stamps. Tomorrow is the day for our new stamps to be revealed and we couldn't be more excited to share! Here's my card to give you a little teaser for what peachy country style goodness is on it's way tomorrow. This may be my favorite release yet (for obvious reasons) and I think you're gonna LOVE IT!! Isn't she ADORABLE? The big toothless grin is a show stopper! This image is a part of the Stamp of the Month, and there's so much more included in this amazing set. I am also showcasing the July Peachy Pick Kit as all of the card stock, ribbon, twine, and embellishments are a part of this month's kit. The image was stamped with Momento Tuxedo Black Ink and color with Copic markers. I paper pieced the dress and added some shading directly to the patterned paper with my Copics as well. If you head over to the Peachy Keen Stamps Blog, you will find more inspiring samples from our designers and be sure to go back to Monday and Tuesday's posts to see ALL their fabulous work! I hope you can join us tomorrow night at 6 p.m. CST for the full reveal and Release Party! There will be challenges, chatting, PRIZES and some amazing inspiration from our Peachy Keen Designers. 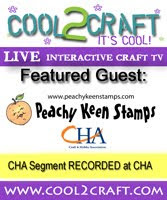 Drop by The Peachy Keen Connection and follow the links to the party and challenge threads for all the fun!! Hope to see you there!!! You do not want to miss it - 25% off almost everything! Thanks for dropping by for the sneak peek! Have a safe and happy 4th of July and happy stamping! Absolutely adorable card. I'm so glad that I am a stamp club member. Every month I look forward to the amazing stamps. Thanks for sharing. Seriously cannot get over that face too funny. So glad that I'm a stamp member. Hope you had a great 4th my friend. What a cute and country card!! I LOVE how you made her dress and as always your coloring blew me away!! It always does.